Relationship abuse occurs between people in intimate relationships, and can occur with family members. It can take many forms, including emotional, sexual, physical and even threats of abuse. Have you experienced domestic abuse in a past relationship? Have you experienced abuse from a parent or family member? Are you looking for ways to heal, grow and find meaning from your experiences? 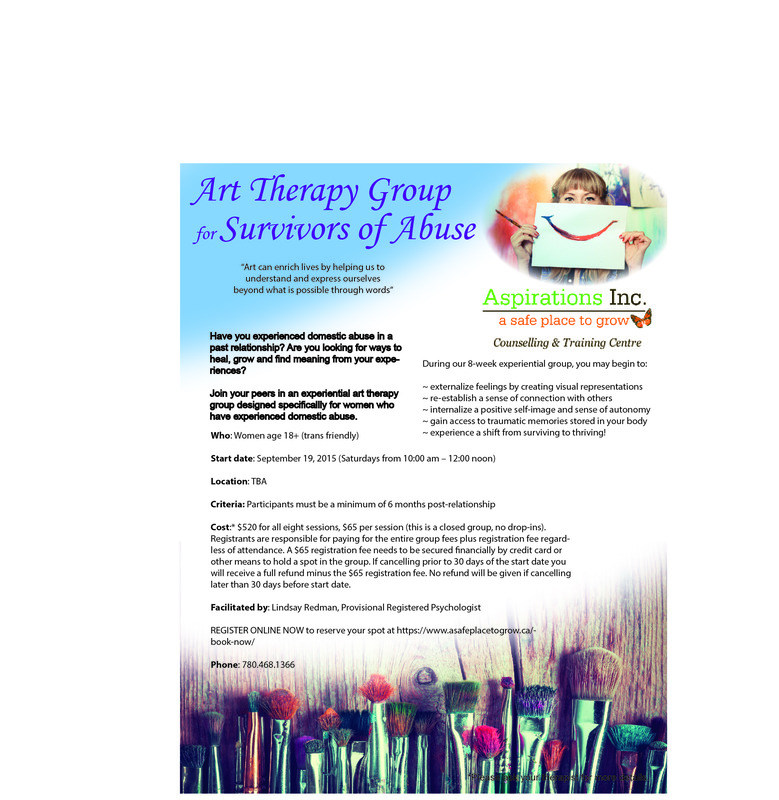 Join your peers in an 8 week experiential art therapy group designed especially for women who have experience relationship abuse, and have been outside of the relationship for 6+ months. Externalize feelings by creating visual representations. Re-establish a sense of connection with others. Internalize a positive self-image and sense of autonomy. Gain access to traumatic memories stored in your body. Experience a shift from surviving to thriving. (This is a closed group, no drop ins). The registration fee will need to be secured financially, either by credit card or other means to hold a spot in the group. Registrants are responsible for paying the entire group fees plus registration fee, regardless of attendance. If cancelling prior to 30 days of the start date you will receive a full refund minus the registration fee. No refund will be given if cancelling later that 30 days before the start date. Facilitated by: Lindsay Redman, Provisional Registered Psychologist. Spots are limited to ensure safety and depth of personal process. NEW CLIENTS REGISTER Online now to reserve your spot or by calling (780) 468-1366. Art can enrich lives through helping individuals to understand and express themselves beyond what is possible through words. Art therapy can be empowering for women, It provides an opportunity to feel more in control of our lives by providing us with freedom to choose materials, style and subject matter and to create whatever we want to create. Art therapy provides distance and control, and thus provides a sense of safety and containment, which allows individuals to release built up tension and anxiety.